to empower them to be honorable, compassionate leaders. Responding to the religious and educational needs of young women suffering the ravages of the French Revolution, Saint Julie Billiart, a peasant woman born in Cuvilly, France, founded the Congregation of the Sisters of Notre Dame on February 2, 1804. In the brief span of twelve years, she saw the opening of many schools in France and Belgium and established the Mother House at Namur. She died there in 1816. Today, the Sisters of Notre Dame de Namur is an international congregation with a presence on five continents. In 1856, Saint John Neumann invited the Sisters of Notre Dame de Namur to Philadelphia. They first settled in the Parish of the Assumption on Spring Garden Street, moved into the St. Joseph's College building on the corner of Filbert and Juniper Streets in 1861, and finally to West Rittenhouse Square in 1867. The Academy of Notre Dame at Rittenhouse Square, fondly referred to as "The Square," educated generations of Philadelphia's girls and boys — teaching them, in the words of Saint Julie, "what they need to know for life," emphasizing concern for others, and the love of God, Our Lady, and the Church. 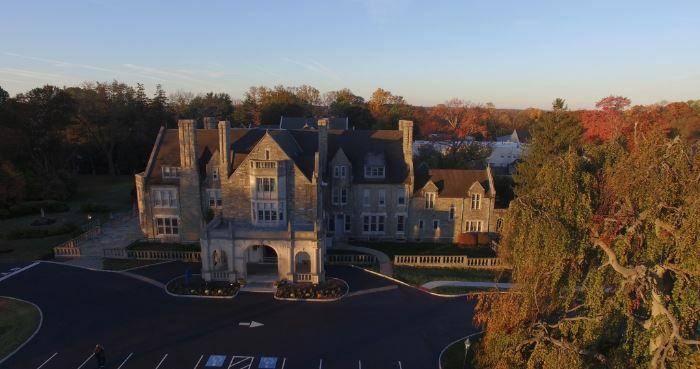 When space constraints began to limit the school's growth, Sister Rosalia, the Provincial, accepted Cardinal Dougherty's suggestion that she purchase the Geist Estate in Villanova to house the high school division. Sisters and students arrived there in early January, 1944. In 2006, the Academy’s Board of Trustees purchased the campus from the Sisters. Since that time, the Academy has operated as an independent school affiliated with the Sisters of Notre Dame de Namur.